While tuning my Oakley and other homer VCO synth modules I originally used to use and old £45 Maplin "Precision Gold" multimeter of 1990 vintage and use the surprisingly accurate frequency counter on there to set the VCOs to the A440 international tuning standard. However I'd seen a prototype Moog module in the booklet of the Switched On Bach CD box set which Bob Moog once made as a Christmas Present for Wendy Carlos. I thought it was time for a crystal controlled reference oscillator design. The requirements were standard crystal stability (easily good enough for analogue synths), sine wave output and extreme simplicity and cheapness. The frequency source is a standard 1MHz crystal oscillator based around a 4069 inverter. 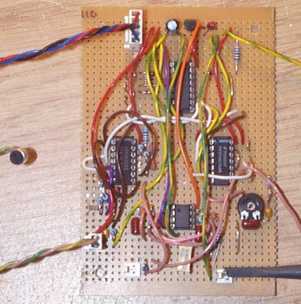 The output from this is squared up by a second inverter in the package to drive the inverting clock input of the 74HC4040 counter and the clock input of the first D-type latch. The counter counts upwards, during which time the 2k2 pull-up is always held low through one or more of the diode-OR paths. Only when the count of 1135 is reached does the pull-up and the input to the D-type rise at the falling clock edge. This high logic propagates to the counter reset input on the next rising clock edge resetting the counter and holding it low, meanwhile the count of zero has made the data input to the D-type low. So the next rising clock edge is required to clear the reset and allow the counter to start again. This D-type reset arrangement allows consistant resetting of the counter which would happen rather asynchronously if the pull-up was fed directly into the counter asynchonous reset. The extra cycle accounts for the N-1 selection of the counter reset value on the diodes. This circuit is a cheap replacement for the 4059 programmable divider counter in many applications. The 4059 is becoming rare and only ever seems to come in a 0.6" width package for historical reasons. A divide ratio of 1136 from 1MHz takes us to 880.28Hz and the further D-type divide by 2 brings us down to 440.14Hz. This I judge to be close enough to 440Hz, being out by 0.03%. The second D-type also crucially provides a square wave output rather than the very rectangular reset output from the counter. The square 440Hz signal is d.c. blocked, R-C low pass filtered and fed via a gain control pot into a high Q gyrator circuit. This is tuned for maximum output then the gain trimmer adjusted to provide 0dBrms output. The result is a good looking sinewave. 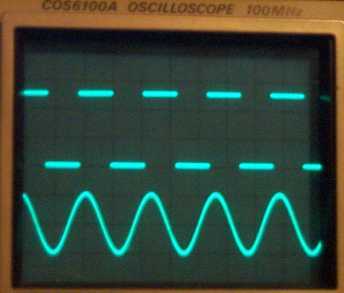 This shows the 440Hz 5V square wave and the 2Vpp sine wave after filtering. Of the four remaining 4069 inverters two of them are used in linear mode as a condenser mic pre-amp. There is enough gain so that the outputs eventually saturate and the two remaining buffers drive an LED which is connected to the 440Hz square wave output. The LED only lights when the outputs are in opposite states so represents an XOR or mixer funtion. This way, you can have your synth note coming out on your studio monitor speakers and being picked up on the internal microphone. Then without having to do any plugging, the LED will flash at the beat frequency and finally show a very slow beat when you have got your synth nicely tuned. You could also plug the synth output directly into this input if you wanted. It provides a quick and easy check for tuning as you do your composition, without you having to switch your brain into 'tuning' mode.You need to use a low current high brightness LED, but this works fine.